Lee Bedonie is a Navajo stone carver whose preferred material is Minnesota pipestone. He principally carves pipes, though he also carves a few animal figurines. We've been collecting and using his pieces for over five years and it seemed time to pass these on a little. Lee's pipes are carved from stone from the Pipestone National Shrine in Pipestone, Minnesota. While there are other pipestone deposits in the United States (Globe, AZ and black pipestone, steatite, from the eastern U.S.), Minnesota pipestone usually has a little darker color and often has pink speckling. There is some variability to the grain of the stone, but all pipestone is superior for its smoking qualities. The shrine is actually a possession of the National Park Service, but is administered by the Pipestone National Shrine Association, in essence a group of Sisseton-Wahpeton Sioux who seek to further the historical use of pipestone as a carving material. The stone is quarried by hand and only a few tons are quarried each year. Contrary to many claims, this stone is not in danger of depletion (at its present rate of quarrying). Pipestone is the summum of smoking pleasure. This soft, argilaceous stone absorbs heat very well and has a cooling, mellowing effect on the smoke. While smoking, the stone will slowly heat up, but never gets hot to the touch. Of course, our recommendation concerns smoking tobacco or kinnickinnick (which consists of infinite blends but, by definition, should contain red willow bark). Specifically, we do not recommend smoking more than one substance in the same pipe. A tobacco pipe should remain a tobacco pipe and an herbal pipe (used to smoke kinnickinnick, mullein, coltsfoot, etc.) should remain an herbal pipe--the tars of each type of smoking mixture will "cure" the pipe and flavor it. All Lee's pipes have a well-bored stem with perfect air flow. When possible we encourage use of a pebble in the bowl to prevent ash being drawn through the stem (as metallic screens lend a poor taste to the smoke). Length: 3 1/8" ����������Widest width: 1 3/16"���������� Height: 1/2"
Diameter of bowl: 1/2"���������� Depth of bowl: 5/16"
**Note: We only sell one-piece, personal pipestone pipes. We do not sell two-piece, stem and bowl pipes because of their connotation as religious objects. Two-piece pipes represent the moveable altar of Northern Plains religious culture and we do not feel that it is our purview to deal in them. They can be acquired directly from the Sisseton-Wahpeton at the Pipestone Shrine. If you decide to acquire a two-piece, stem and bowl pipestone pipe, we highly recommend that you buy one with traditional sumac stem. 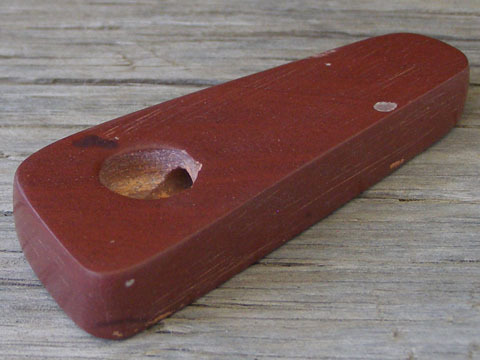 The standard stem sold by the Shrine is made of Western Red Cedar, which has a bitter flavor and fouls the smoke (in our opinion). Sumac lends a slight sweetness to the smoke and it is well worth it to wait an extra two weeks and pay a few dollars more to get a custom sumac stem made by the folks at the Shrine. Incidentally, when you want to replace the stem after a few years, you can send your pipe back and they will make you a new one to fit your pipe. (Just one reminder: if you're smoking illegal materials in your pipe, don't send it via the Federal USPS, or via any other carrier, across state lines or you may end up as a guest in Mr. Jones' gulag). Contact the Pipestone Shrine at: (507)825-5463.